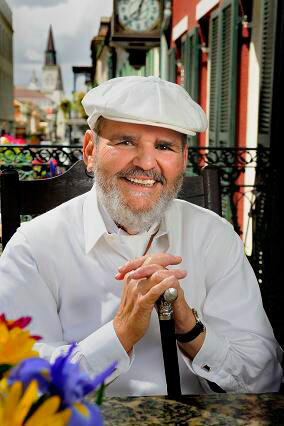 Famed Turducken chef, Paul Prudhomme, led the charge for celebrity chefs by bringing Cajun cooking to the masses. A true pioneer in the realm of chef branding, Prudhomme made an early mark with instructional cooking videos and proprietary spice blends. Countless TV chefs have since mimicked his blueprint for success. Cajun cuisine now seems a perennial favorite, but before Prudhomme appeared on the scene, there were few people North of Mississippi that even knew what it was. Chef Paul's larger than life personality brought the unique French-inspired cooking into the mainstream, through recipe-packed cookbooks and widely distributed Cajun spice blends. Prudhomme mastered the unusual cuisine through a lifetime of cooking, and by working under noted Louisiana chefs. As a native son, it was a completely natural progression for Chef Paul to open K-Paul's Louisiana Kitchen in New Orleans. An instant hit, the restaurant has now achieved iconic status and continues to serve full dining rooms nightly. The Chef's fame has grown, and his brand now encompasses many facets like television personality, restaurateur, cookbook author, and retailer. But it all comes back to the food - and in that realm Chef Paul has never looked back. He learned Cajun and traditional Louisiana cooking in his own kitchen and continues to be passionate about these native regional flavors. But at the same time, Prudhomme has been influenced by other regional flavors, working them into his dishes to continually renovate his repertoire. The widely use culinary method of “blackening” was not invented by Prudhomme—it's traditional Cajun—but he can be credited with making the method popular. Did Prudhomme invent the Turducken? The jury is out on that one, but his name is surely associated with this holiday favorite that layers duck, chicken, and turkey into one Cajun-inspired main dish. Best-selling cookbooks written by Chef Paul number nine at last count. Themes are decidedly New Orleans, with an emphasis on the fiery spice blends that bring Cajun and Creole dishes to life. 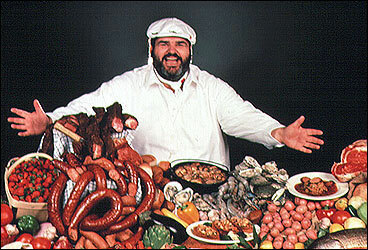 Chef Paul Prudhomme's Louisiana Cooking is the 1984 title that really got the ball rolling for Louisiana inspired cooking, and for the Chef himself. Prudhomme set the early pace for many chef-branded TV cooks that followed. His unique ability to market his own personality alongside his products is an admirable trait. Perhaps his first marketing coup relates to his signature spice blends. Creole and Cajun cooking are defined by the bold character of the seasonings they employ, and Chef Paul recognized that the public would be most likely to embrace these flavors if he made the spice blends available to home cooks. By branding each jar of spices with an image of himself smiling ear to ear, Prudhomme gave his products a unique identity on store shelves. Magic Seasonings became the gold standard for anyone wanting to experience Southern Louisiana cooking firsthand – with the help of a native son. Expanding and tweaking the spice mixtures over time has kept Chef Paul's products relevant thirty years after they were launched. Prudhommes brand has grown to include a diverse line of goods that are sold in stores, and directly on his website. Dozens of spice combinations, coffee, and authentic smoked sausages; like Andouille, are the bread and butter of this Cajun cooks enterprise. In addition to his other noted accomplishments, Prudhomme continues to operate K-Paul's Louisiana Kitchen in the French Quarter. The restaurant employs an executive chef and 4 sous chefs, so if you're a Cajun-loving chef student, set your sights on employment with the Prudhomme group. Executive Chef, Paul Miller, has worked in and around Louisiana as a tried and true Cajun chef. He directs the kitchen at K-Paul's but also works on menu creation and developing Chef Prudhomme's retail line, particularly the smoked meats. Along with K-Paul's Louisiana restaurant, Chef Prudhomme pours his culinary energies into his K-Paul's Catering Expedition. This end of the business serves up on-site or off-site custom catering with Chef Paul at the helm. Location is not an issue. The smiling chef is also available to other restaurateurs for menu consultation and recipe creation. He speaks at trade shows and other food events, and conducts seminars and lectures that continue to focus on Louisiana cooking, and hospitality success. Chef Paul is an active fundraiser for multiple charities.